There are many different types of braces or brackets used in orthodontics to straighten teeth. 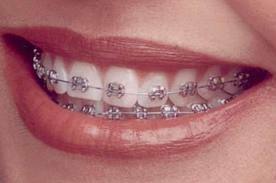 Common types of braces are silver (metal) braces, clear braces, or invisalign. If you are looking to get braces, know that most orthodontists offer several types of braces to better accommodate certain cases or specific requests of the patient. However there is no right or wrong type of orthodontic braces to use for any given case. In general, every bracket functions as an attachment site for the orthodontic wire, which provides the dynamic force on each tooth to cause movement. Since the bracket itself is not directly responsible for tooth movement, the numerous bracket designs mainly reflect variations in their size, shape, color, and material. Silver metal braces are the most commonly used in orthodontic treatment, and are made of a durable mixture of stainless steel, nickel and various other metals in small amounts. There are hundreds of variations of these braces, but all have the key characteristic of having overhanging edges, or “wings”, around which a metal or elastic tie is used to hold the orthodontic wire in place. Elastic ties come in several different colors and are responsible for the decorative “braces colors” seen on young patients’ teeth. These types of braces allow the wire to be tied in very tightly to the bracket, allowing excellent control in aligning crooked teeth. 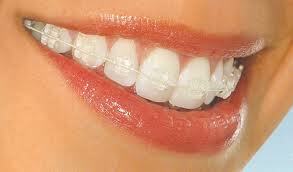 Generally, these silver metal braces cost less compared to clear braces or other cosmetic options. Clear braces serve as a cosmetic alternative to traditional metal braces by minimizing the visibility of the braces on the teeth. Typically, these clear orthodontic braces are made of ceramic or plastic alloys, but function in a similar manner to traditional metal braces. Most commonly chosen by adult patients, clear elastic ties and white metal ties are available to be used with these clear braces to help keep the appliances less noticeable. Usually, clear braces cost more than metal braces. If you are considering getting braces, but do not know whether to go with the metal or clear ones, know that clear braces are more brittle than metal braces. Thus, taking the clear braces off at the end of orthodontic treatment can be more difficult and time consuming. Usually, the orthodontist will use a special plier specifically designed for removing clear braces to minimize breakage. Even if a clear bracket does not totally detach from your tooth, your orthodontist can still polish the broken bracket from your tooth without any harm to your tooth. So do teeth move slower with ceramic braces? Not necessarily. You may notice that most clear braces are not 100 percent ceramic. Often there is a metal slot in the clear braces for the wire to sit in. This metal slot reduces the friction of the bracket and also adds a little flexibility to resist breakage. Most orthodontists can treat just as well using clear braces as they can with metal braces. Fantastic office... I recommend it to everyone who wants to be treated like family....when you come inside you are greeted by Vera and Liz who are friendly and helpful with any questions or concerns you may have... I always get nervous when the assistant takes me to the back to start but at EZ Dental RDA Liz made me feel comfortable and what I liked the most was how gentle she was from taking X-rays to polishing my teeth... I was very fortunate to be treated by both Dr. Gasparian and Dr. Hakopyan....they are great doctors that take their time examing, explaining the treatment, and performing excellent work that makes you want to smile all the time...GREAT TEAM TO HAVE ON YOUR SIDE...Love you guys see you all at the next checkup! I recently came in to get my regular routine cleaning since changing from my previous dentist for many years and the front staff was very welcoming I filled out my paperwork and was seated right away... very welcoming place the Dr was very informative and the assistants were professional as well, I'm very satisfied with the work that was done. !